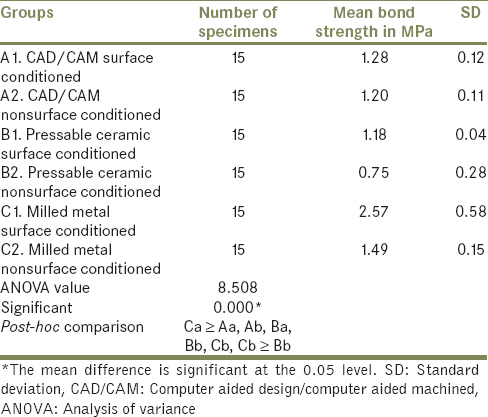 Background/Purpose: The aim of this study was to compare the shear bond strength of computer aided design/computer aided machined ceramic (CAD/CAM), pressable ceramic, and milled metal implant copings on abutment and the effect of surface conditioning on bonding strength. Materials and Methods: A total of 90 test samples were fabricated on three titanium abutments. Among 90 test samples, 30 copings were fabricated by CAD/CAM, 30 by pressable, and 30 by milling of titanium metal. These 30 test samples in each group were further subdivided equally for surface treatment. Fifteen out of 30 test samples in each group were surface conditioned with airborne particle abrasion. All the 90 test samples were luted on abutment with glass ionomer cement. 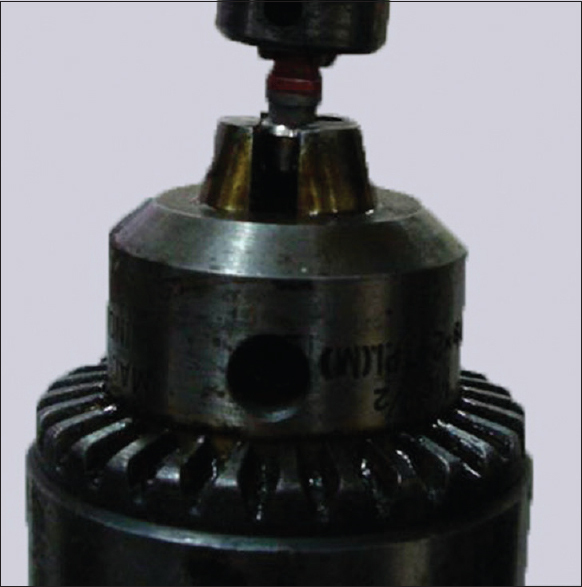 Bonding strength was evaluated for all the samples using universal testing machine at a crosshead speed of 5 mm/min. The results obtained were compared and evaluated using one-way ANOVA with post-hoc and unpaired t-test at a significance level of 0.05. Results: The mean difference for CAD/CAM surface conditioned subgroup was 1.28 ± 0.12, for nonconditioned subgroup was 1.20 ± 0.11. The mean difference for pressable surface conditioned subgroup was 1.18 ± 0.04, and for nonconditioned subgroup was 0.75 ± 0.28. The mean difference for milled metal surface conditioned subgroup was 2.57 ± 0.58, and for nonconditioned subgroup was 1.49 ± 0.15. 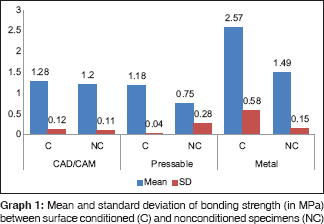 Conclusions: On comparison of bonding strength, milled metal copings had an edge over the other two materials, and surface conditioning increased the bond strength. CAD/CAM technology, all ceramic systems, and high strength ceramic materials have become integral parts of modern dentistry. Optimal esthetics and characteristics such as color stability, high wear resistance, and low thermal conductivity make all ceramic materials ideal for the fabrication of dental prostheses. The main advantage of all ceramic systems lies in the absence of metal, especially in cases with very thin tissue thickness and shallow implant depths allowing a more esthetically pleasing restoration. Retention certainly influences the lack of complications as well as the longevity of implant prostheses. Over the years, those engaged in implant supported restorations have debated as to which type of mechanism is preferable for increase bonding of cemented restorations. 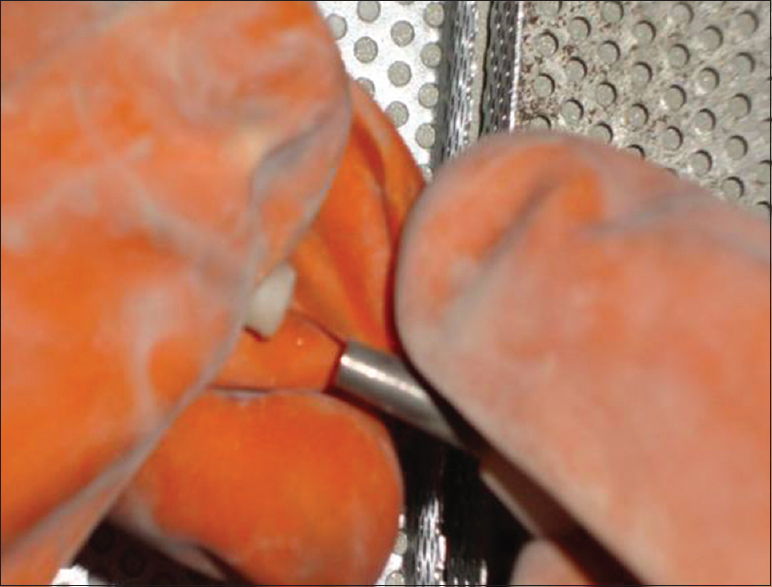 The success of implant-supported restorations depends on the success of bonding between prosthesis and metal interface. Retention of crown depends on cement used, surface preparation of the implant abutment, and other variables such as internal surface characteristics of coping and the height and taper of implant abutment. For better simulation of clinical conditions, investigation of the bonding or retentive strength should be studied using axial dislodgment forces. Numerous studies investigating the bonding strength of different luting agents on retention of cement-retained prosthesis and also effect of airborne-particle abrasion on zirconia copings are available, but there is a paucity of studies having direct comparison of different copings to the best of our knowledge. Due to the above concerns, there is a need for comparing the shear bond strength of abutment copings of different materials, made by different techniques as well as effect of surface conditioning on bonding. The null hypothesis was that there was no difference in bond strength of abutment copings made of different materials and also no effect of surface conditioning on bonding. The alternate hypothesis states that there was difference in bond strength of abutment copings, and also surface conditioning affected the bonding strength. 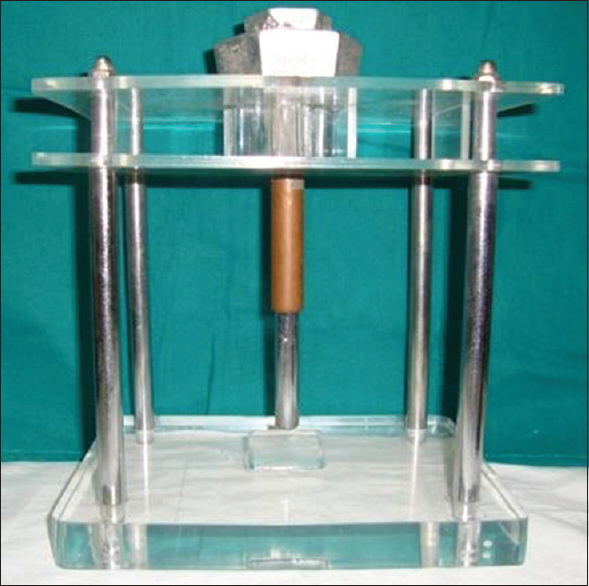 The present research is a cross-sectional in vitro study aimed to compare the shear bond strength of different copings and effect of surface conditioning on shear bond strength of three different types of abutment copings made on titanium implant abutment (Indident Dental Implant System, DRDO Inmas, New Delhi, India). For Group A, 30 CAD/CAM zirconia copings were fabricated on one implant abutment [Figure 1]a using cercon CAD/CAM system (Dentsply, Germany). Scan spray containing silver particles was sprinkled on abutment. Optical scanning was done with cercon eye. Once the scanning was completed with cercon eye, cement gap, wall thickness, and occlusal geometry were adjusted for the coping with the help of cercon art program. A luting gap of 30 μm and wall thickness of 0.8 mm were chosen for the coping fabrication. Presintered zirconia blank of 38 size was inserted in cercon brain to complete the milling. After milling was completed, the frameworks of the coping were separated from the blank with the help of micromotor and sintered in furnace, according to manufacturer's instructions. Dimensions of CAD/CAM coping was measured with digital caliper (Shenzhen YKS Technology Ltd., China). For Group B, 30 pressable ceramic copings of similar dimensions as that of CAD/CAM copings were fabricated on implant abutment [Figure 1]b. (IPS E-max, Ivoclar Vivadent, Liechtenstein). Implant abutment was screwed on implant analog, and two coatings of die spacer (Durolan, DFS) were applied on implant abutment to attain the same cement space. To attain the similar dimension as CAD/CAM coping, silicon index was fabricated of CAD/CAM coping extending on the predetermined groove on implant analog. Molten inlay wax (Geo-dip, Renfert, Germany) was poured in silicon index, and mounted abutment was inserted in that index to the level of predetermined groove. Investment of wax pattern was done in silicone ring with the phosphate bonded investment material (IPS PressVEST Speed). The IPS E-max press ingot was inserted in hot investment ring. Investment ring was inserted in the center of hot press furnace (Multimat 2 touch + press) using investment tongs; selected program was started. After cooling of the ring, the sprue and reaction layer on the copings were removed, and copings were retrieved. Dimensions of pressable ceramic coping were verified with a digital caliper. For Group C, 30 milled metal copings of similar dimensions as that of CAD/CAM copings were fabricated on implant abutment [Figure 1]c. The wax pattern was fabricated in the same manner as for pressable copings. Wax pattern was scanned in the computer true definition scanner (TDS). 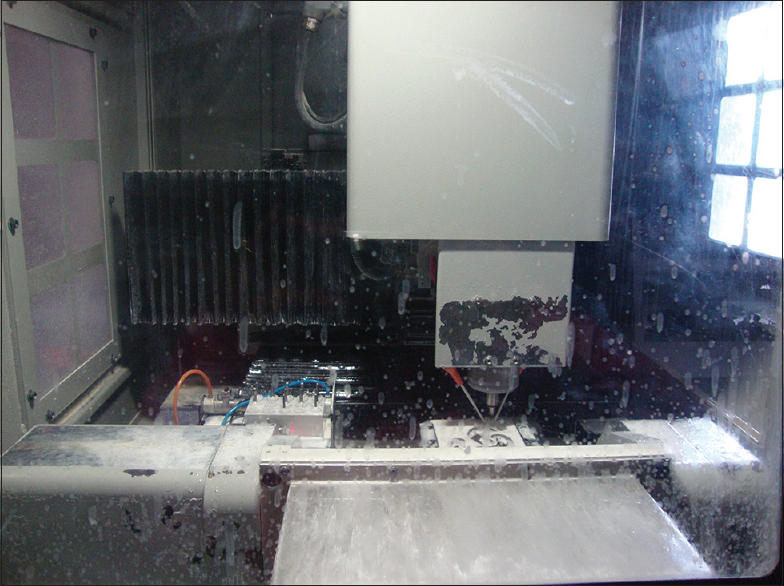 The CAD volume data was transferred to the multi-axis metal milling machine (TDS cutter, Turbodent system, Taiwan). Copings were milled from titanium blank using the existing data [Figure 2]. Copings were separated from the blank. Again, dimensions were verified using digital caliper. Subgroup C2 (n = 15): Milled metal copings that were nonconditioned. All specimens were cemented to titanium abutment using glass ionomer cement (GIC) (Meron, VOCO GmbH, Germany) to make standardization, which was mixed according to manufacturers' recommendations. An alignment apparatus [Figure 4] was used that applied a weight of 750 g to the bonded specimens. Extra cement was scraped out,  and after initial set (8 min), specimens were stored in distilled water for 24 h to simulate the moist oral environment. The shear bond strength was evaluated by pull-off test for all the abutment copings. All calculations were performed using the SPSS (version 16) for windows (SPSS Inc., Chicago, IL, USA). A one-way analysis of variance was computed for statistical significance at P = 0.05 for individual groups with post-hoc (Tukey's Honest Significant Difference) and intragroup comparison was done by unpaired t-test. The mean difference for CAD/CAM surface conditioned group was 1.28 ± 0.12, for nonconditioned group was 1.20 ± 0.11. The mean difference for pressable surface conditioned group was 1.18 ± 0.04, and for nonconditioned group was 0.75 ± 0.28. The mean difference for milled metal surface conditioned group was 2.57 ± 0.58, and for nonconditioned group was 1.49 ± 0.15 [Graph 1] and [Table 1]. On intragroup comparison, results showed that pressable ceramic and milled metal group had the statistically significant difference (P = 0.05) in conditioned and nonconditioned specimens [Table 2]. Bonding strength was highest for milled metal surface conditioned group. The least bonding strength was found for pressable nonconditioned group. The mean bond strength value with air abrasion specimens was higher. 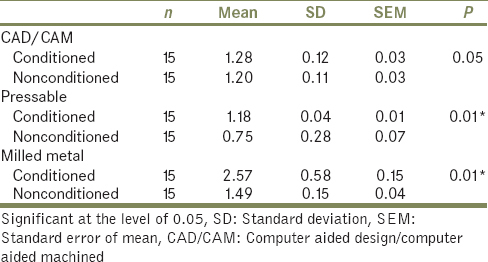 On intergroup comparisons, CAD/CAM, pressable, and milled metal surface conditioned specimens had statistically significant difference, and similar results were found for nonconditioned specimens [Table 3]. This study assessed the bonding strength of copings made out of different materials and also evaluated the effect of surface conditioning on bonding strength. The results of this study led to the rejection of null hypothesis that there was no significant difference in the bond strength of tested groups. Metal copings fabricated by milling technique provided much stronger retention as compared to other materials and also surface conditioning increases the bonding strength. Ebert et al. in 2007  found similar results when evaluating the effect of two surface conditioning methods and two luting gap sizes on the bonding of zirconia copings. He found that air-abraded copings increased the retention. Airborne-particle abrasion has also been recommended as the best method of pretreatment in previous studies to improve the bond strength to oxide ceramics. Sadig and Al Harbi  compared the effect of different surface conditions on the retentiveness of titanium crowns cemented abutments using two types of cement. Results showed that sandblasted castings and pretreatment of abutment exhibited the greatest retentive strength. Shahin and Kern  in 2010 also concluded that air-abrasion significantly increases crown retention. In the present study, GIC was used to cement milled metal and all ceramic copings. Although resin cements has got the maximum retention for all ceramic restorations, previous studies assessed that GIC has also got the adequate retention. Maeyama et al. compared the retentive strength of metal copings on prefabricated abutments with five different luting agents. GIC has got the sufficient retentive strength for luting cement retained superstructures. GIC was used for luting all the specimens to make standardization, and moreover different resin cements require different pretreatment which could alter results. GIC show high water solubility and require sufficient time for complete setting reaction to maximize their retention. Manufacturer of GIC states that the material will reach its full set in 4-7 min so 8 min setting period that was allowed in the previous study should prove satisfactory. The limitations of this study include that all copings were produced and tested under ideal conditions, which may not reflect conditions in daily clinical practice. Thermal cycling and long-term water storage are the factors that can have effects on the durability of bond strength,  and they are important parameters to simulate the oral conditions. In terms of in vivo loading, the masticatory cycle consists of combination of vertical and lateral forces, subjecting the restoration to a variety of off-axis loading. In the current investigation, the cemented copings were subjected to only axial forces. No single in vitro test provides an accurate indication of the intraoral environment. Hence, future studies should attempt to simulate intraoral conditions, as well as utilize additional mechanical tests, which can provide a more reliable assessment of retention. Within the conditions and limitations of this in vitro study, milled metal copings had the highest bond strength as compared to CAD/CAM and pressable ceramic copings. Surface conditioning with air-abrasion achieved better bond strength of all type of copings. Further studies are needed to evaluate optimal surface conditioning in order to enhance the longevity of restorations clinically. Kim JT, Cho SA. The effects of laser etching on shear bond strength at the titanium ceramic interface. J Prosthet Dent 2009;101:101-6. Ehrenkranz H, Langer B, Marotta L. Complete-arch maxillary rehabilitation using a custom-designed and manufactured titanium framework: A clinical report. J Prosthet Dent 2008;99:8-13. Taira Y, Matsumura H, Yoshida K, Tanaka T, Atsuta M. Influence of surface oxidation of titanium on adhesion. J Dent 1998;26:69-73. Att W, Komine F, Gerds T, Strub JR. Marginal adaptation of three different zirconium dioxide three-unit fixed dental prostheses. J Prosthet Dent 2009;101:239-47. Michalakis KX, Hirayama H, Garefis PD. Cement-retained versus screw-retained implant restorations: A critical review. Int J Oral Maxillofac Implants 2003;18:719-28. Jugdev J, Borzabadi-Farahani A, Lynch E. The effect of air abrasion of metal implant abutments on the tensile bond strength of three luting agents used to cement implant superstructures: An in vitro study. Int J Oral Maxillofac Implants 2014;29:784-90. Tashkandi E. Effect of surface treatment on the micro-shear bond strength to zirconia. Saudi Dent J 2009;21:113-6. Witkowski S, Komine F, Gerds T. Marginal accuracy of titanium copings fabricated by casting and CAD/CAM techniques. J Prosthet Dent 2006;96:47-52. Ayad MF, Fahmy NZ, Rosenstiel SF. Effect of surface treatment on roughness and bond strength of a heat-pressed ceramic. J Prosthet Dent 2008;99:123-30. Schiessl C, Schaefer L, Winter C, Fuerst J, Rosentritt M, Zeman F, et al. Factors determining the retentiveness of luting agents used with metal- and ceramic-based implant components. Clin Oral Investig 2013;17:1179-90. Bottino MA, Valandro LF, Scotti R, Buso L. Effect of surface treatments on the resin bond to zirconium- based ceramic. Int J Prosthodont 2005;18:60-65. Sadig WM, Al Harbi MW. Effects of surface conditioning on the retentiveness of titanium crowns over short implant abutments. Implant Dent 2007;16:387-96. Shahin R, Kern M. Effect of air-abrasion on the retention of zirconia ceramic crowns luted with different cements before and after artificial aging. Dent Mater 2010;26:922-8. Biscaro L, Bonfiglioli R, Soattin M, Vigolo P. An in vivo evaluation of fit of zirconium-oxide based ceramic single crowns, generated with two CAD/CAM systems, in comparison to metal ceramic single crowns. J Prosthodont 2013;22:36-41. Maeyama H, Sawase T, Jimbo R, Kamada K, Suketa N, Fukui J, et al. Retentive strength of metal copings on prefabricated abutments with five different cements. Clin Implant Dent Relat Res 2005;7:229-34.